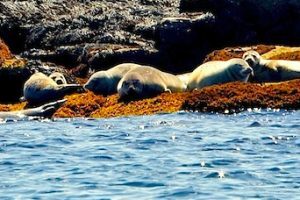 An unforgettable ride along seven oysters farms that are just re-opening for the season, and the view of charismatic harbor seals, ospreys fixing up their nests. Bald eagles, herons, eiders, loons and a wide variety of ducks are in full swing. The Oyster Bar will be open. These are always a Mom and crowd pleasers. Blankets are provided. May is a very busy month on the River. Seals give birth to their pups just as the springtime migration of alewives introduces an abundance of food to the tidal river. The trip is partially narrated about how the annual migration of alewives effects the habitat on the Damariscotta River and the amazing interdependency of alewives and its wildlife. A memorable scenic tour, a drink in hand, and an unbeatable view. Enjoy the sparkling lights on the river during our fireworks cruise. 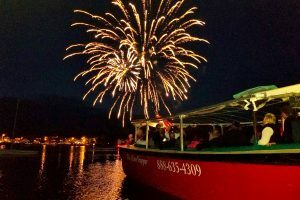 Oyster Bar & cocktails onboard and the magical sky will be lit up for everybody’s delight upon returning to Damariscotta Bay during our fireworks cruise. The River Tripper will be making special, one-hour tours to Pemaquid Oyster Company’s farm. 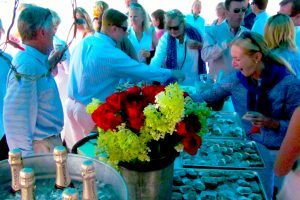 This year’s docents onboard will be from Pemaquid Oyster Co., ready to answer all your questions about the celebrated shellfish. Tickets are only sold online for the first tour. Cost: Due to the specialized nature of chartering a boat, pricing varies according to your specific needs.